Marjorie Louise Cazier, 94, passed away on May 18, 2017 in Mesa, Arizona. She was born on March 23, 1923 in Glenpool, Oklahoma. Survived by her children: Scott R. Cazier, Rebecca Chant and Kathryn Lopez. Graveside services will be held in September in Globe, Arizona. 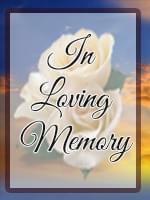 In lieu of flowers, donations may be made to Hospice of the Valley in Mesa, Arizona.